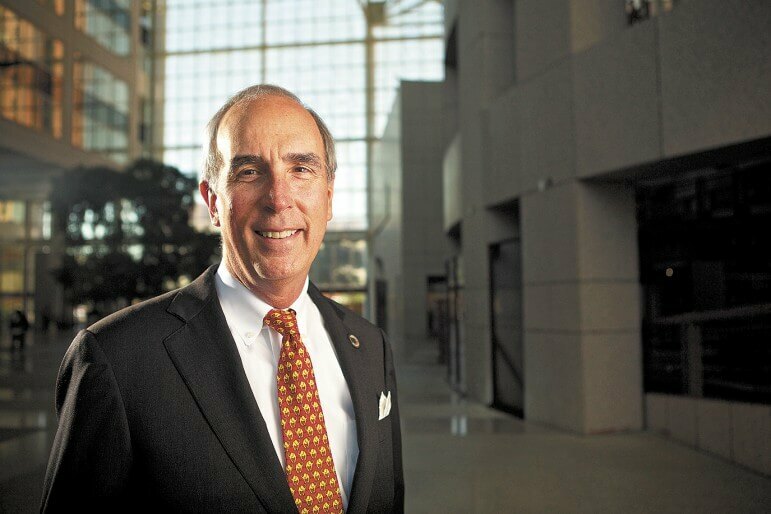 Two budgets, a map pinpointing dozens of capital improvement needs and several political showdowns with the Mobile City Council have marked Mayor Sandy Stimpson’s first year in office. Despite some struggles, Stimpson said he’s learned from the discord and counts getting the city’s fiscal house in order among his credits. All in all, he wants to take the knowledge he’s gained from a full year in office and move it forward into the remaining three years of his first term as mayor. With more experience, Stimpson said he’s confident his administration can accomplish more than it already has. In an interview earlier this month, Stimpson said members of his executive staff were only weeks away from firming up top priorities for year two. Improving neighborhoods and public spaces will be a priority, as well as improvements to public housing and infrastructure, which can help economic development, Stimpson said. The mayor’s office is limited in its control over public housing though, as Stimpson only has appointing authority to the Mobile Housing Board of Commissioners, and in his first year only one seat came up for re-appointment. Stimpson said his office is still reviewing candidates to replace Ruby Lang. Lang’s seat is designated for a resident of public housing. Housing Board Chairman Clarence Ball’s term ends next September, while Norman Hill’s term ends in 2016, Melvin Clark’s term ends in 2017 and Donald Langham’s term ends in 2018, according to city records. Most of those have served on the board since the Dow Administration. As an additional part of the strategy map’s long-range plans, Stimpson would also like to find a way to improve public transportation. Although not responsible for its inception, Stimpson has been in office long enough to witness several delays in the opening of the GulfQuest National Maritime Museum. 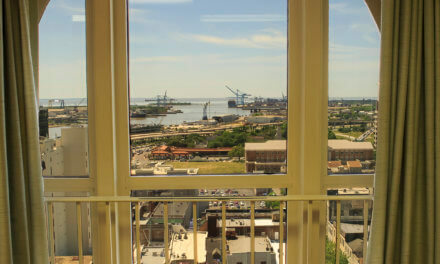 Since issuing a certificate of occupancy for the building mid-year, the opening is now out of the city’s hands, Stimpson said. City spokesman George Talbot said the GulfQuest board is looking at a soft opening in December and a public opening in March. But Stimpson isn’t interested in sitting idly by while the museum gets its sea legs, and said he hopes to use his office as a “bully pulpit” to promote the facility as it prepares to, and ultimately does, open for business. For his part, Stimpson does believe it will be successful. “I do think it’s a world-class facility based on my walk-throughs of it,” he said. “I think the question marks everybody has in their mind are things we won’t know until we hit the deck running, and that’s will we get people to attend, and not just our citizens, but can we get the visitor to stop and go there? Can we divert some of the traffic off of (Interstate) 10 to go there, like they do the Battleship? Right beside GulfQuest sits another huge project that hasn’t produced what was expected for the city, but it’s not too late for the Alabama Cruise Terminal to pay off, Stimpson said. The city is keeping the channels of communication open with the cruise industry, although nothing promising has taken shape, he said. Part of the reason it has been so hard for Mobile to gain a foothold in the cruise industry is because the market has changed since the cruise terminal was built. There’s not much the city can do to bring a cruise line in, Stimpson said, aside from paying $500,000 for test cruises out of Mobile. Even though the chances of seeing another cruise ship docked at the terminal anytime soon seem slim, Stimpson wouldn’t go so far as to call building the facility a mistake. Stimpson said there has been discussion about repurposing the cruise terminal, but admitted no hard offers had been considered. Stimpson said Austal could possibly use it in the future, or it could be useful for GulfQuest, or the I-10 bridge construction project, even just as a parking lot. He said he’d personally like to see a developer build a condominium complex on top of it, but the city remains open to finding a way to repurpose the structure. The momentum for the proposed $850 million I-10 bridge project has been building, especially over the last four months, Stimpson said. Several factors lead him to believe the project can be completed in the next decade, even if funding isn’t available immediately. He said a delegation of mayors and representatives from Mobile and Baldwin counties received a warm welcome during a recent trip to Washington, D.C. Additionally, the project is a priority for U.S. Sens. Jeff Sessions and Richard Shelby, who will each have new, more important roles in the next Congress. The momentum has led to a greater focus on finding funding, which Stimpson said would be key in getting the project started. As far as adding bicycle and pedestrian lanes to the plan, Stimpson said he’s all for it, as long it doesn’t hold up the project. 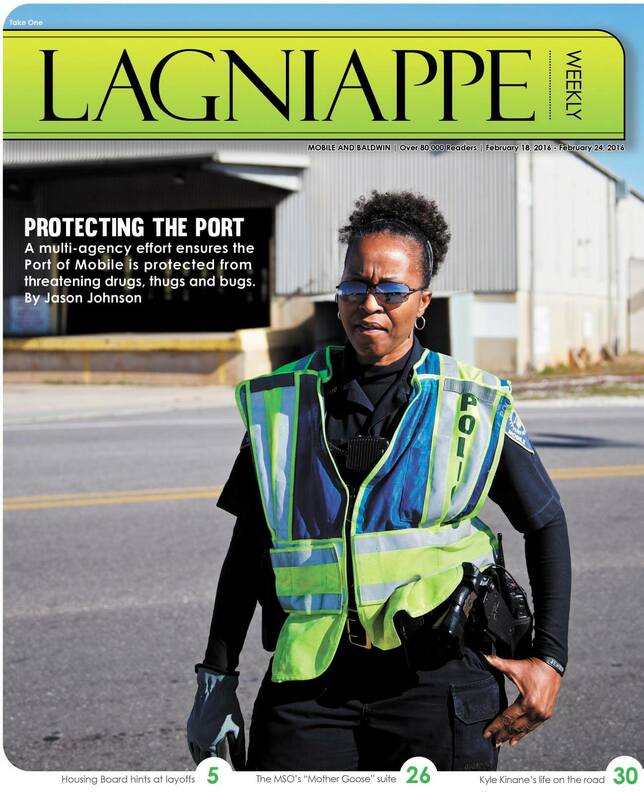 More bike and pedestrian walkways, however, is a part of the city’s strategic map moving forward and ties in with a $12.1 million project Mobile recently applied for through the state’s RESTORE Act portal. The city will look to make sections along Three Mile Creek into a greenway, or series of bike and pedestrian pathways, Stimpson said. 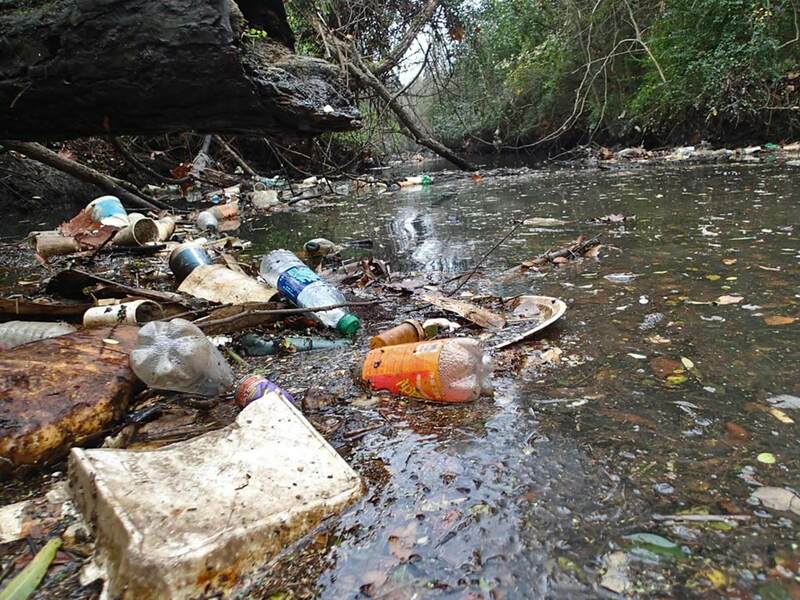 The city hopes, at least, a portion of the greenway can be funded through money set aside because of the oil spill and would make the city accessible for cyclists and pedestrians from nearly the University of South Alabama campus to downtown. If his vision is realized, Stimpson said downtown will be vastly improved and enhanced by the end of his term by new construction and renovation and a loosening of code restrictions that should make doing business with the city easier, he said. Recently, business owners have complained about fire codes that leave little wiggle room and make it more expensive to renovate a building for a new business. Stimpson said he’s aware of those complaints and has made recommendations to address them. Stimpson said the problem with the fire codes and their apparent restrictiveness comes down to interpretation. The codes could be interpreted to make it easier for someone to renovate a building in the city, he said. The administration is still mulling a possible replacement for former interim Fire Chief Randy Smith, whom Stimpson nominated for the job before deciding to go in a different direction. “Where we currently stand is Assistant Chief Billy Pappas is in charge, running the day-to-day operations, and we’re still assessing what our next move is regarding the position of chief,” Stimpson said. He wouldn’t name any specific candidates, but said the administration is still looking internally for a chief and is currently “doing leadership assessments” to help make a determination. Councilors and Stimpson alike believe a strong working relationship between them is key to the success of the city. At times in his first year, Stimpson’s relationship with the board’s members was tested. In addition to a showdown over Councilman Fred Richardson’s appointment of former Mayor Sam Jones to the Mobile Area Water and Sewer System board that ended with Stimpson supporting the appointment, the council and Stimpson were at odds on two issues in the fiscal year 2015 budget that made headlines. Councilwoman Bess Rich said Stimpson is always very accommodating whenever she needs to speak to him. Councilman John Williams said he doesn’t believe Stimpson could do more to keep the lines of communication open, but added that there is unnecessary tension between the administration and the council that can’t really be explained. Council President Gina Gregory said the relationship can be trying at times, but she applauded Stimpson’s willingness to reach out. The administration has already released its plan for infrastructure improvements and the council has countered with a proposal to split money generated by an extended increase of a 20 percent sales tax into seven equal parts for infrastructure improvements on a district-by-district level. One of the biggest complaints is the condition of streets and councilors have complained specifically in the past about portions of Ann Street, Texas Street and Baltimore Street in Midtown. Stimpson said he knows about the complaints, but said projects of that magnitude might require collaboration from two or more entities. “It may even have to be — and I’m framing it up — it may have to be MAWSS, the city, the county to do something there, if that’s possible because part of the deterioration has to do with infrastructure … under the street,” he said. The challenges that come with fixing the city’s ailing infrastructure means a longer trek when trying to get Mobile on sound financial footing. Stimpson adds to his list of accomplishments, beginning the process of getting the city’s financial house in order, but it’s far from where it needs to be, he said. Stimpson also takes great pride in having helped to avoid a possible downgrade in the city’s general obligation limited tax rating from Moody’s in June. A downgrade would have negatively impacted interest rates on future debt service, and would’ve increased the city’s debt. In addition, Stimpson takes credit for beginning the implementation of a new software system for the city. The existing programs were so old the software in almost every department had to be replaced. Through an agreement, Mobile will become Tyler’s biggest customer, Stimpson said. Stimpson also touted as an accomplishment the leadership change within the Mobile Police Department, with the appointment of Chief James Barber.